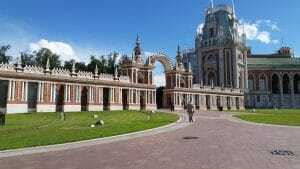 Tsaritsyno is a park and museum complex in southern Moscow. 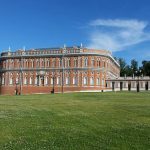 Currently one of the largest reserves in Moscow, the land started as an aristocratic estate. 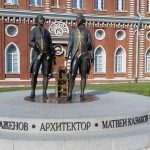 It was then purchased by Catherine the Great to become one of her royal estates before eventually being given up for public use. The seminar itself focuses on the history of the reserve and some of the important Russian characters behind it. We started our walking tour by meeting Roxana, the SRAS Moscow Student Coordinator, on the Tsaritsyno metro platform. Exiting the station, we only had short walk to the park. Still, we were far enough from the center of the city that the atmosphere on the street was decidedly different. There were kiosks and small stands similar to the ones downtown, but they were weathered and sold cooler things like watches and clothes (as opposed to the usual ice cream and snacks you could find in the city center kiosks). Once we were at the park, Roxana began the informational part of the tour by giving us a general overview of the history of the park. 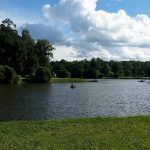 She told us that Tsaritsyno began as an aristocratic family’s estate. 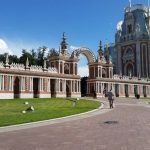 It was purchased by Catherine the Great after she passed through the land and enjoyed the area, and thereby gained the name “Tsaritsyno”. 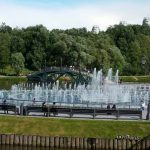 As we walked down the gentle slope from the park entrance towards a large fountain and lake, Roxana continued. Speakers around the fountain were playing Africa by Toto, a song that felt hilariously out of place and definitely brightened my day. 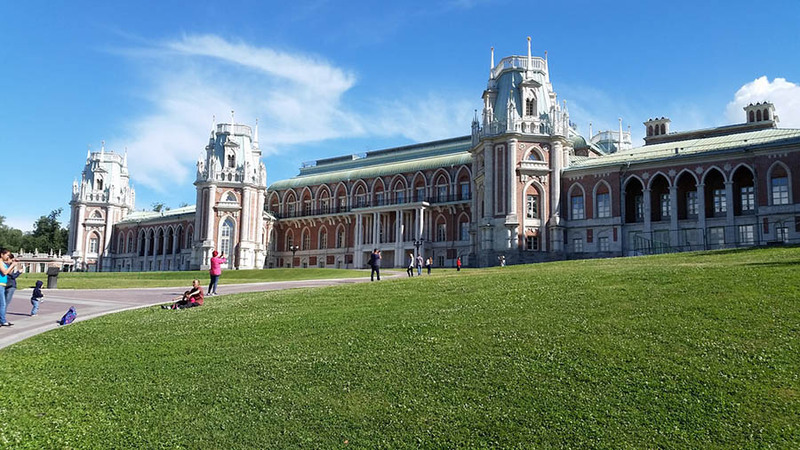 We then learned that the empress had her favorite architect, Vasilii Bazhenov, construct a palace on the reserve that would take him eight long years to complete. Unfortunately for Bazhenov, Catherine disliked his design and had his work torn down. 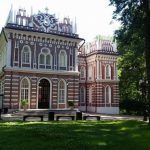 His contemporary, Matvei Kazakov, took over and began building a second palace, but his work also fell into disfavor and was never completed. We kept walking, and eventually made it to the main grounds of the palace. Roxana once again gave us the rundown. 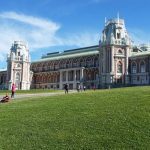 The large palace that is visible today was restored in the early to mid-2000s (and is based on Kazakov’s design, not Bazhenov’s). 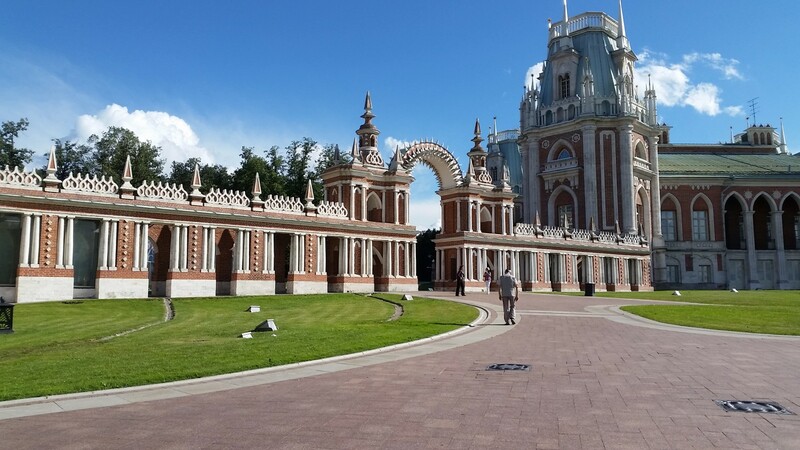 Several other important structures (all designed by Bazhenov) exist on the main grounds: the Bread House, the opera house, the small palace, a church, and an old bridge. The Bread House was the all-inclusive servant work space, as the aristocrats of the time didn’t want to see them in the palaces. The opera house was exactly what it sounds like. Strangely, the small palace wasn’t what it sounded like. According to Roxana, no one is really certain what the structure was built for, thus it received the name as a best guess. The church near the large palace predates Catherine’s ownership and stands out for its excellent examples of Russian-Orthodox religious iconography. 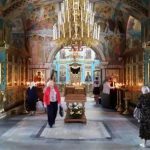 As we walked through it, we saw that inside was painted with brilliantly colored depictions of saints, scenes from church history, and complex metalwork. Finally, we walked across the old bridge before heading behind the large palace to start our picnic. 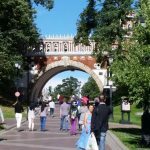 Roxana let us know that the bridge was an original (unlike the other rebuilt structures on the grounds) and was one of the best surviving examples of the Russian Gothic architectural style. Sitting down for the picnic, we all helped unpack and generally had a good time sharing stories about our experiences so far. After the picnic, we continued on to the last part of the tour. 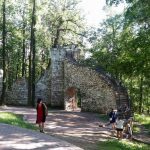 Walking deeper into the reserve, we came across several smaller buildings that were apparently build to commemorate days and events that Catherine the Great enjoyed throughout her life so that she would always be able to remember them. Next, we walked by a “ruined tower”, that was actually built to look ruined on purpose at the empress’s request. This fact, compounded with everything else I learned about the estate, made me start to think that Catherine had some unresolved issues. At the very least, she seemed to have a fickle personality. Finally, we finished off our walking tour with a mix of extremely ancient and modern history. The path leading out of the park wove through a very hilly area. We learned that these small hills were actually kurgans, which are ancient Slavic burial mounds. Then Roxana finished with the last hundred or so years of the park’s history. 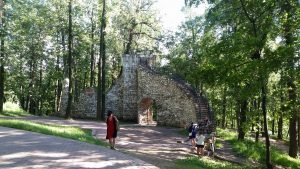 The park was open to the public in the late 1800s. It then became a space for dachas after the soviet revolution. 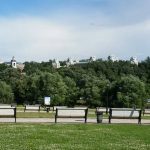 Finally it was reconverted into a public park in the last few decades of the 1900s and so it remains today. 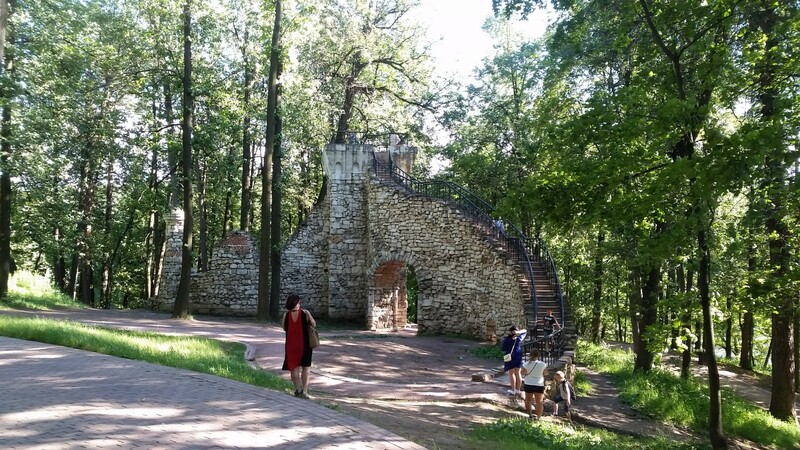 Of all the parts of the tour, I’d have to say my favorites were the church for its beautiful art, the ancient burial mounds for their mysterious history, and the stories about Catherine the Great for how capricious they made her seem. So if you’re trying to decide on taking the tour or not, you definitely should. 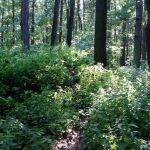 The grounds are beautiful in the summer and are something you can’t afford to miss.